Quilters Newsletter issued a quilt challenge entitled Celebrate 45 Years of Quilting to readers in the February/March 2014 issue. Participants were instructed to create a 45" x 45" quilt that celebrates 45 years of quilting. XLV was my entry. It celebrates Quilters Newsletter’s forty-fifth anniversary using the traditional numeric system of timepieces, Roman numerals. The Plus X blocks contain the first digit, L’s can be found in the middle border, and the outer chevron border contains the V’s. The center square is representative of a gemstone, a classic anniversary gift. Traditional and modern aesthetics were combined to commemorate Quilters Newsletter’s rich history and exciting future. Monochromatic tones hint at a bygone era, while bold hues exude current color trends. Solid fabrics and a medallion style were chosen due to their timeless nature. Vintage blocks such as the Four Patch, Half Square Triangles, and Flying Geese evoke tradition, while playing alongside Plus X and Chevron blocks. Dense machine quilting portrays a similar paradox; traditional cross-hatching and cathedral window patterns join geometric shapes and matchstick quilting. Quilters Newsletter, congratulations on XLV wonderful years. Here’s to your past, present, and future! The center medallion is paper-pieced. The half square triangles were created by placing squares 1" larger than the finished size right-sides-together and stitching 1/4" on either side of a line drawn diagonally from corner to corner of the wrong side of the lighter fabric. After pressing, a cut was made on the drawn line. The resulting half square triangles were squared to the correct unfinished size. Flying geese were created using the No Waste Method. The Cross X blocks combined strip piecing and stitch and flip techniques. The L blocks and four patches were were strip pieced, while the chevron blocks used stitch and flip triangles. I used an assortment of free-motion quilting designs and stitched in the ditch for stability. The backing is this colorful Dr. Seuss print. 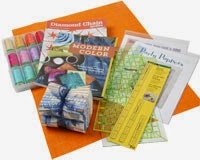 I am the very fortunate winner of the grand prize, which included a Bernina 750 and this fantastic prize package. 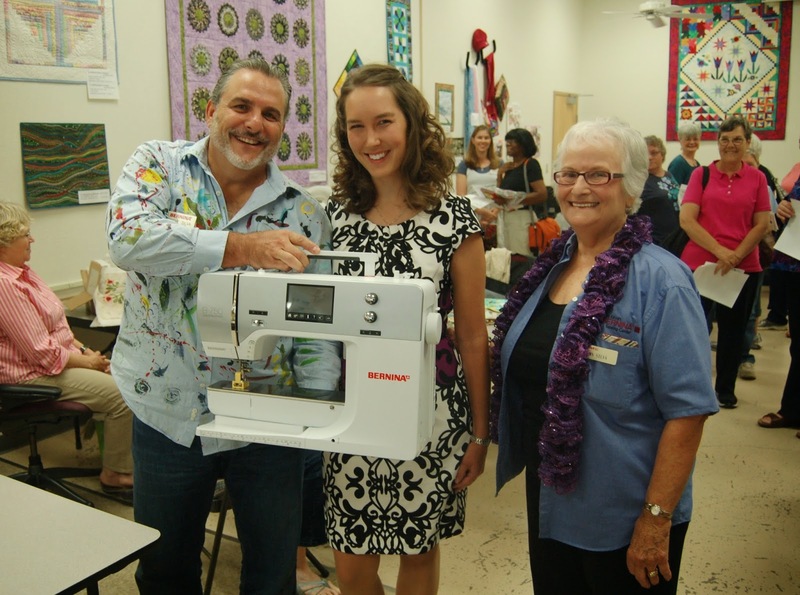 Ann Silva's Sewing Center presented me with the Bernina 750 during their Open House. It was a joyous event for me! I am very grateful to the generous sponsors. The other entries show an incredible wealth of talent and creativity. You can see the top five entries on the Quilters Newsletter website. All sixteen finalist quilts will be featured in the December/January 2015 issue of Quilters Newsletter. Thank you for your sweet encouragement. I'd be honored if you'd come back by the blog to see my upcoming projects. Wow, great job, Afton, and congratulations! I love how you took something traditional (roman numerals) and make a very modern quilt based around it. And what an amazing prize! Thank you, Yvonne. I'm glad that, after contemplating and drafting several ideas, I chose this one. I'm still in disbelief about how blessed I have been. Fantastic - you definitely deserved it - congrats! Thank you. I am so grateful that they picked my quilt, as there were certainly many formidable options. Judging must have been very difficult. Wow!! Congrats! This is just stunning. Thank you. It's a honor to have you visit. I love Quilty Habit, and regret not participating in the Orange Peel Quilt Along. I'm not going to be able to resist petals and peels for much longer. They are just too fantastic! Afton! What an absolutely stunning quilt and well-deserved win! The roman numerals, monochromatic colors,... just everything about the thoroughly thought out design makes this a hands-down grand prize quilt. Congratulations! Thank you. I appreciate your encouragement, as I honestly don't understand how I managed to be chosen when I look at the other entries. I wanted to mention that I enjoy reading your blog. 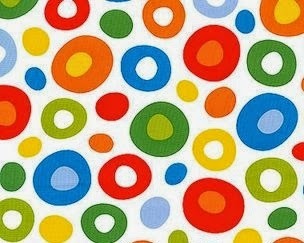 Your FIshies pattern is great, and I love the Color Inspiration posts. Perhaps I'll make some palettes using the photos I took at the International Rose Test Garden in Portland. Congrats on the success of the Late Night Quilters Club on Facebook. I look forward to joining the gigantic crowd for some sewing past dark. Wow! I am so happy and excited for you. Such a beautiful quilt with a great meaning. You definitely deserved the grand prize. Thank you. I enjoy your blog. Your feathers on Berry Pie blew me away! I can totally relate to children happy dancing, and being way behind on scrapbooking. I'm still resolved to finish my son's first year book. (He's four.) It's going to take me a few more craft nights at the local sewing lounge to get that checked off my list. Thank you. I enjoyed seeing your photos from the fair at Love of Quilts. It's always a joy for me to see the quilts at our fair. Thank you, Alison. I consider myself extremely fortunate. Congrats! Your quilt is amazing. Love the colour choices and am wowed by your quilting! Thanks for dropping by, and for your sweet words. Congratulations on such an amazing quilt. The design is just amazing and perfect. And what an awesome prize bundle. You absolutely deserve it. What an amazing quilt, you definitely deserved the grand prize! Thanks, Wendy. How's the Craft Room tidying coming along. My sewing room looks strikingly similar. I too am working on it. Wow I was reading this thinking "oh my gosh what a fabulous idea I hope you won!" And you did! congratulations its an amazing quilt and so well thought out. Wow, wow, and wow! Wonderful quilt. Thanks for the details. You absolutely deserve the Grand Prize. Enjoy that Bernina!